The Bombie Bar in Coalcliff has been closed down. One Sunday afternoon a month, Coalcliff Surf Club opened it’s amazing doors to the public and provided live music, giving the community a meeting place, and raising money for the surf club. Now, Wollongong Council has ordered Coalcliff SLSC cease running all performances immediately. The venue has also been asked to revise its name to The Bombie presented by Coalcliff SLSC so the building retains it’s identity as a surf club. The closure follows an ongoing noise complaint. 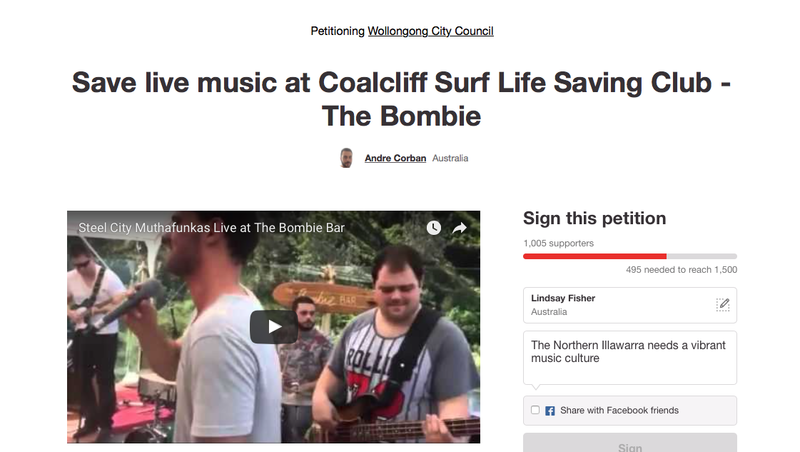 The organisers say they’ll lodge a DA for a new version of the venue, however this is expected to take some time, and until then, the Bombie Bar is no more. Organiser Rob Deacon has thanked all the musicians, volunteers and patrons who have supported the Bombie per the years. A petition has been launched HERE to save the venue, which, at time of writing, has already amassed more than 1000 signatures.